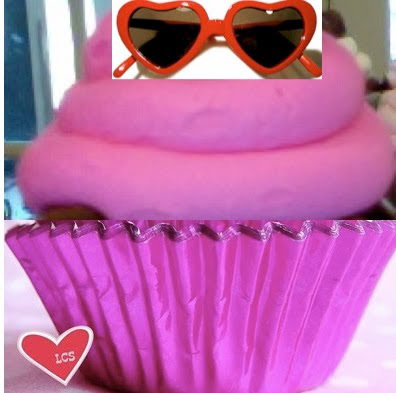 Katy + Cupcakes = Oh, HELL YEA! 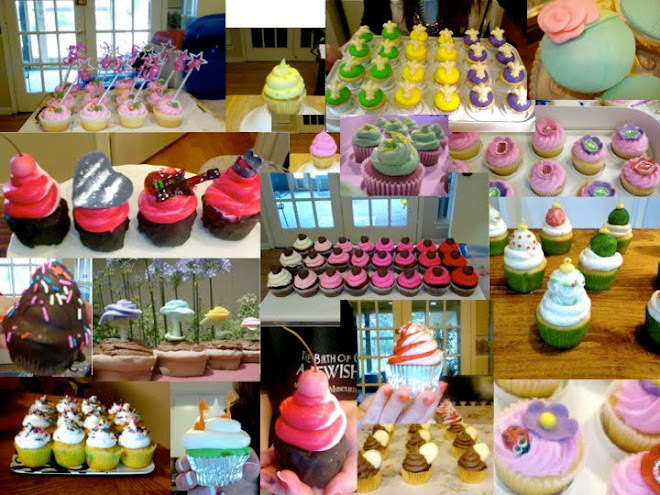 This is my inspiration board for the Katy Perry Cupcakes I want to do! and strawberries with faces on them. Shes The Fierce, Gum Drop Queen of Wonderland! 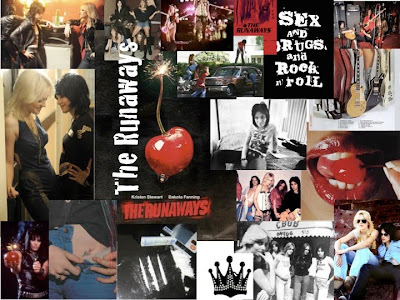 This is a video tutorial for my cupcakes that celebrate the first all girl rock and roll band-'The Runaways'-as well as their movie based on the band's real life experience- 'The Runaways'. 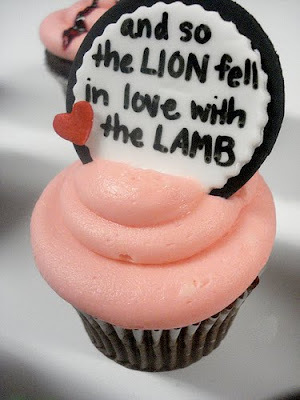 So-I felt the cupcakes I made for the release of the movie 'The Runaways' needed something. I thought about it for days, and settled on this design! 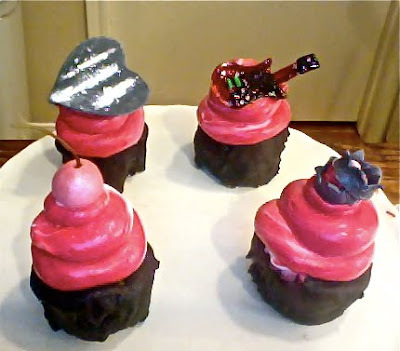 The first all girl rock band deserves an edgy set of cupcakes! And THESE are just that! 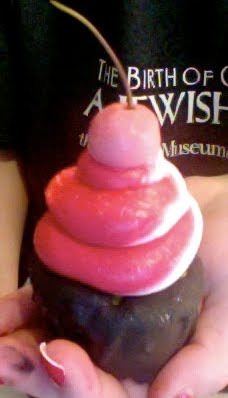 Iced with a cherry/vanilla frosting that swirls between crimson red and white. My R-Rated decoration-A black gum paste heart representing 'The Black Hearts'(the band Joan Jett was in after "The Runaways"). 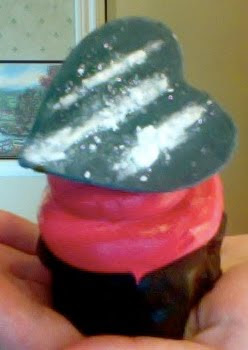 I added powdered sugar in lines of cocaine as a shout out to the drugs the band took in the 70s! 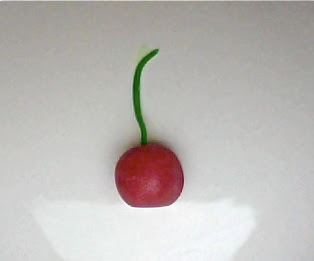 Gum paste cherries represent 'Cherry Bomb'-the most popular Runaways song. 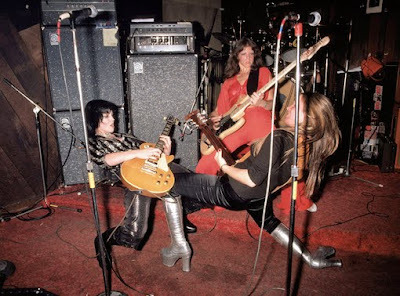 I duplicated Joan Jett's Gibson Guitar for another topper, and made gum paste black crowns to represent 'The Queens of Noise'-another Runaways classic! 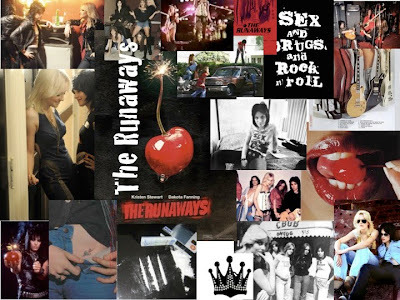 Here's my Runaways inspiration board. I tend to collect all the pics and info I can about the cupcake theme I'm working on, and I put it all in a collage to pull ideas from. 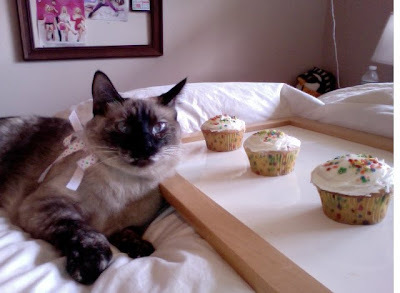 These are some old pics of my Jasmine Macaron Bennett chilling with some cupcakes! They're probably my favorite photos of her. 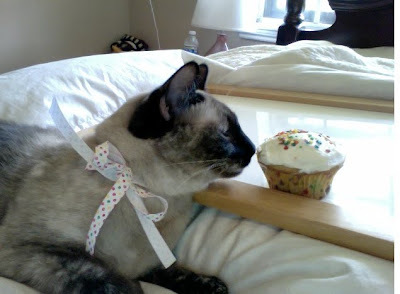 I didn't make those cupcakes(a talented teenage baker made them)-but I DID tie that bow! 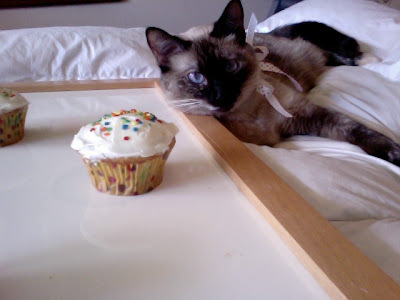 Me and Jasmine-We're a cupcake loving two-some. We're practically the same person! ...or kitten...I mean person/kitten...a Pitten!...except her fan base is wider, and she's named after a Disney Princess/French cookie/Jane Austen character, while I was named after...a coin... Kisses, Lovebugs!! So- Instead of finishing the edits of my cupcake tutorial videos, I got distracted and started on a new batch inspired by 70s all girl rock group, 'The Runaways', and the new movie about them. 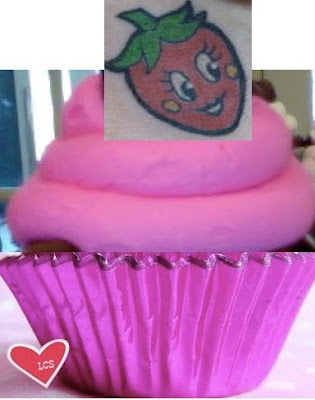 I thought I'd share a bit of my process in designing a cupcake batch. 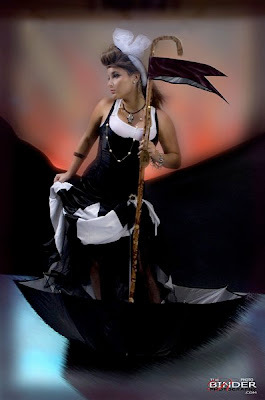 I usually start with an inspiration board with all the pics I like pertaining to the theme I want to do. 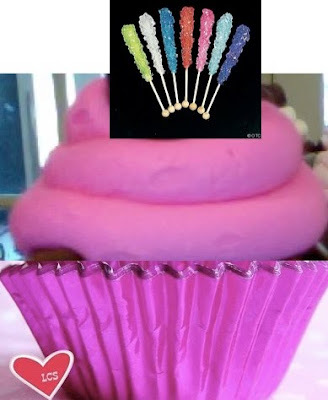 At the top is mine for 'The Runaways' Cupcakes. Next, I pick the icing based on any pics that remind me of a certain flavor...like-If I had a pic of a black high heeled shoe, I'd do dark chocolate icing with sharp edges. 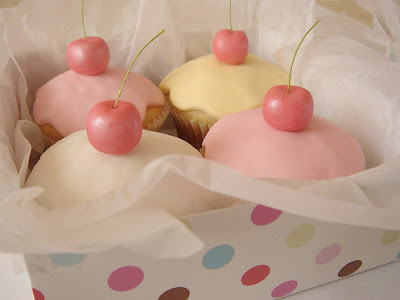 For 'The Runaways', I chose a Bourbon Vanilla Icing with a little bit of cherry flavoring in it. 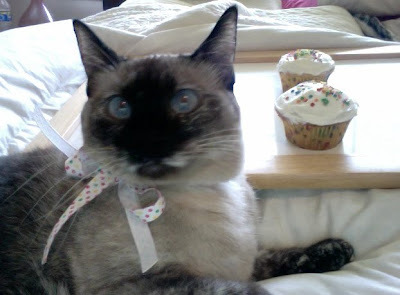 I then decide on what will top the cupcakes. I'm really into Gum paste figures right now, so I chose to do 4 items to go on on this project. 1) Gum Paste Cherries with shimmer dust. 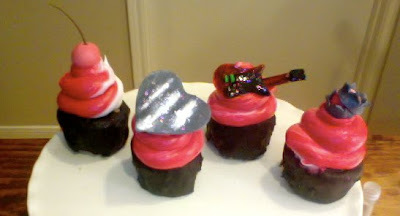 2) Gum paste mini replicas of Joan Jett's guitar. 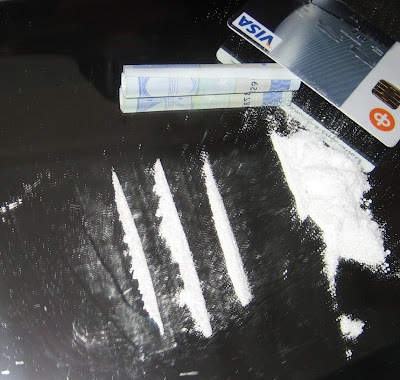 3) Flat squares of dark chocolate with lines of pixi sticks powder to look like cocaine. 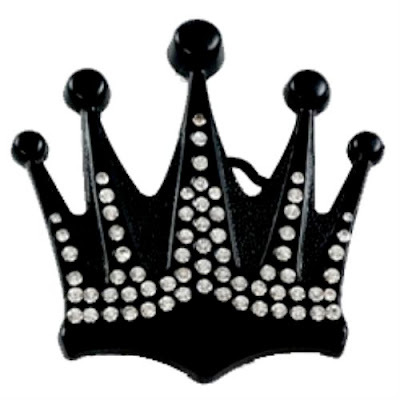 4) Black crowns with dragees that look like metal studs on Joans leathers/rock looks and reference their song, 'Queens of Noise'. Then, I let the figures dry overnight-and I put the toppers on the next day. 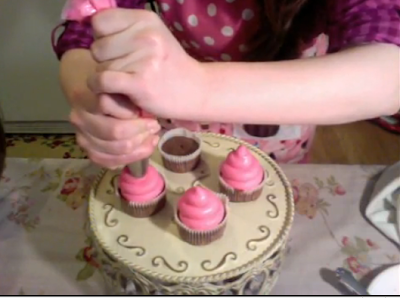 My tutorial will show how to make the figures, and how to make and apply the icing. I can't wait for ya'll to see these tiny guitars! 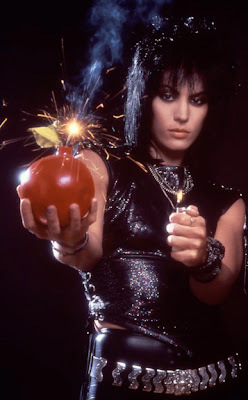 I don't want to show them till I have the video up, but it's worth the wait-So get ready for THAT cherry bomb! 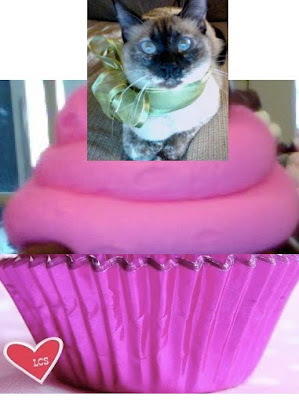 These are the cupcakes I've made recently. I like seeing them all together-like they're a little family! 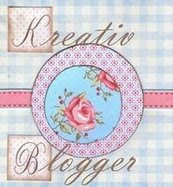 I have FIVE new cupcake tutorials currently filmed and ready to edit. 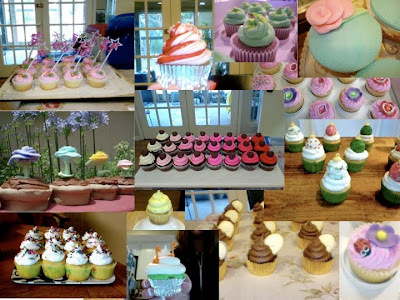 They'll be 'Voodoo Cupcakes', 'Katy Perry Cupcakes', Easter Cupcakes', 'Dreams of Being an Author Cupcakes', and an icing tutorial using a variety of decorating secrets, icing tips, techniques, and home made decoration tools. So, get excited for that! 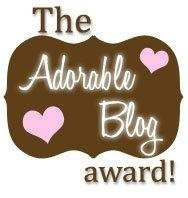 It's gonna be a very important thing for you to be able to say you knew about me -and supported me in my adventures before I became a published author! “Some folks look at me and see a certain swagger, which in Texas is called "walking". 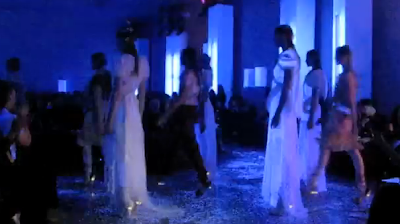 I've loved Rodarte fashions for a while now, but my state of broke-ness stops me from indulging. The almighty God gives you- Things that GLOW! I love it! It's like those light up tennis shoes kids used to rock! It's so 80s fab! All that's missing is some Razzles! Really tho-I can't afford to get them now, but...one day...one day you won't be able to stop me o mighty smiter!! 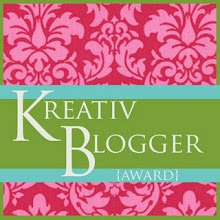 Are you guys coveting anything lately? ...maybe we can all learn something. 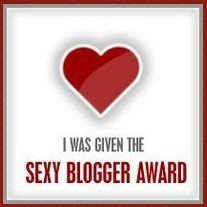 I know I just did! Don't look now, people!! It's Monday! How LAME is THAT?!! Should I stop myself from putting butter in her Jamba Juice?! Soooo...One of my BESTEST friends EVER-Brittany- is also a model. She showed me some of her new pics today, and here's our exact conversation. Brit: "Do you like them?" Penny: *moment of silence* "You're not allowed to walk next to me from now on. I want you at least 5 feet behind me. Fifty would be even better." Penny: "Back it up, biatch!!!" ...I dunno if that ref uniform is regulation length. How can movie stars see through the shades they wear at night? Wouldn't that just make it go from dark to HELLA dark?! Yes- Her skin complexion in real life is really this good! That guitar is gonna get rained on...Or, as my mom would say, "Storm's a brewin!" You can see more pics of her on my youtube channel. .........I'm gonna go get on the treadmill. "You showed up to work in a space shuttle and parachuted into a meeting!" Perhaps the BEST quote EVER! Lady GaGa with KATY PERRY at a house party!! WOWZA!! I'm SO pissed I wasn't invited!! Everybody having a good week?! Monday SUX! Make it go away! I want Friday night-baking and dancing to Queen till 4am!